A multiple-use healthcare card that provides coverage of up to P60,000 for emergency care and hospitalization for viral and bacterial illnesses, treatment of injuries resulting from accidents (except for stroke) in 400+ designated PhilCare-accredited hospitals nationwide. Multiple use healthcard that provides coverage of up to P60,000 for emergency room care and hospitalization expense. Diagnostic and therapeutic procedures as medically necessary during ER and confinement. Health Vantage 60 for Adults is for clients aging from 18 to 64 years old. However, entry age is up to 60 years old only. This card is valid for 1 year upon activation date. Health Vantage does not require medical examinations (for purchase) and hospital deposit (for availment.) It is accepted in 500+ Philcare-accredited hospitals nationwide excluding six (6) major hospitals in Metro Manila (Makati Medical Center, St. Luke’s Medical Center (QC and Global), Asian Hospital and Medical Center, The Medical City, and Cardinal Santos Medical Center). 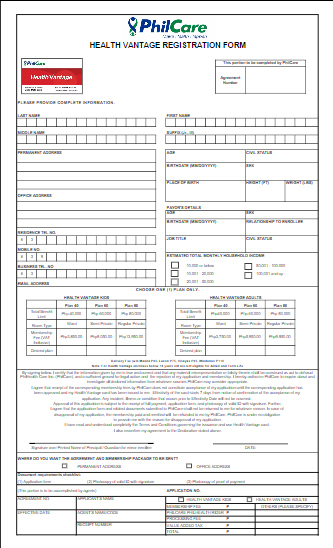 Step 1: Download application form here. Submit an accomplished application form to concierge@briocare.co once payment has been made. Step 2: Present the card with a valid identification to the emergency room staff at any PhilCare-accredited hospital for Health Vantage. Check the list of non-covered illnesses and diseases. Your final medical diagnosis is the basis for PhilCare’s approval of coverage. PhilHealth is required for the availment of this card during hospital confinement.